The free Camping Checklist is the perfect way to make sure your next camping experience is just like relaxing at home. The document is a simple checklist sheet that includes some of the most common items needed to make camping comfortable. You don’t want to be out in the woods with no flashlight or toilet paper. This template just makes your job easier when the time comes for you to pack your gear and hit the road. 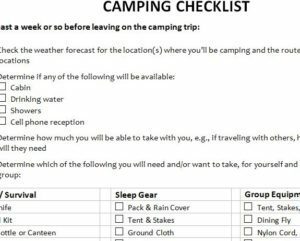 If you’re interested in using the Camping Checklist today, read the guide given below to get started. Start by scrolling to the bottom of this page and clicking the link that we have given you below to download the template file. Now, start at the top of this checklist and take a look at the items that are first given. These items are designed to make sure that planning the time and location are flawless. The last thing that you want to happen is rain coming down when you pitch your tent. Below, in the main table, you will find all the items that you need to pack to make your camping experience amazing! The Camping Checklist breaks up the items by category, so under essentials, you will find first-aid kits, water, food, tent, etc. From there, you can scroll through the different categories and items given to make sure these are the items that you want to bring along. When the day comes where you need to pack for your next camping trip, just take out your handy Camping Checklist and go through and check the items off as you pack them. You can print the sheet by clicking the “File” tab above and then selecting the “Print” option when it appears. Now is the best time to start planning your next camping trip, using this free template.